Now, you haven’t seen a disaster post from me in a while, so it’s probably just about time that I write one for you. If you know me well, you’ll know that I stumble through life moving from one disaster to another. Remember the Christmas tree debacle? And how about the Berwick holiday? That’s the kind of thing I’m talking about. I was given tickets to the Cricket fashion show last night, as part of the Celebration of Style in Liverpool – a whole weekend dedicated to fashion and beauty with events taking place throughout the city. Liverpool is known for being super glamorous – it’s the home of the wags, big hair and, of course, the Scouse Brow – so I was super excited to get tickets. 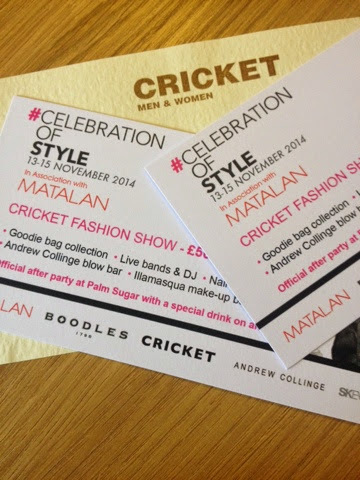 I invited one of my besties to accompany me and we imagined sipping on prosecco (just the one for me, as I planned to drive), eating model-esque canopes (aka air) and drooling over some fabulous threads from sponsors Matalan and Wag-favourite Cricket. After a rubbish Friday at work (I always seem to have stressful Fridays) for us both, we were super excited as we set off for the event which, according to SatNav, was a mere two hours away. Plus, in my Mini Cooper D courtesy car (a whole other disaster story entirely), we were sure we could knock some time off of this. It soon became apparent that this was not going to happen. We drove through towns which were super busy with traffic, adding precious minutes on and then rejoiced as we joined the motorway, sure we could cover some miles on here. But alas, it was not to be. Six junctions took us the best part of an hour and when we realised there was less than an hour of the event left and we were nowhere near, we decided to turn back. By all accounts on Twitter (check out the pics here – @C_of_Style), it was a fabulous night. There was dancing, an amazing fashion show and loads of celebs, including local model Amanda Harrington of Desperate Scousewives fame, Jenny Frost and lots of hot young things from Hollyoaks. I felt like weeping when I finally arrived home after five and a half hours on the road to nowhere and Mr P tried to stifle his giggles. The plus side: I got to spend time with one of my best friends gossiping and I’m sure we’ll laugh about this in years to come…maybe not just yet! And the moral of the story? I’m not too sure, it’s either “never leave the house again” or “set off in plenty of time”! Ahhh soooo sorry to hear you couldn’t make it! !